Bike Fun comes in many flavors. So I’m particularly thrilled to see that John from Point Area Bicycle Service (PABS) will be creating his own spin on Bike Fun this coming Sunday. He is calling his event the Bicycle Adventure Extravaganza. On the PABS Facebook page, he describes it as “poker run, scavenger hunt, and super rad challenges en velo.” I don’t know what to expect out of all this, but it sure has Bike Fun written all over it. The Bicycle Adventure Extravaganza is completely free and anyone may participate. John says there are “killer prizes” based on accumulating the most points. 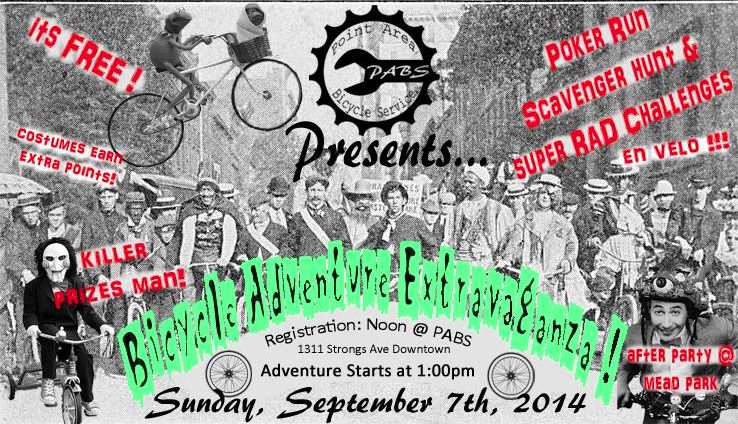 The Bicycle Adventure Extravaganza is on Sunday September 7. Registration starts at 12 noon at PABS, 1311 Strongs Ave in downtown Stevens Point between Main and Clark. John suggests you arrive by 12:15 PM to make sure there is enough time to register everyone. The Extravaganza packets will be distributed at 12:40 PM. Adventurers will have some time to plan their strategy before the bicycling start time of 1 PM. Adventurers will be told to ride bicycles to several locations during the Extravaganza. Each will hand out a card towards the poker hand and will also offer a challenge to perform on the spot. I don’t want to spoil the fun, but John has told me about a few of the challenges and they sound rather silly and fun. Most involve bicycle parts used in rather unusual ways. The scavenger hunt portion of the Extravaganza involves finding objects and landmarks around the city. Adventurers will finally make their way to the free post-Extravaganza party at Mead Park, where winners will be announced and prizes will be awarded. Here is some more information from the PABS event webpage. Expect to ride about 6-8 miles in total. This is not a race, and being fast does not gain more points. Points are based on successfully completing challenges, finding scavenger hunt items, etc. You will need a bag to carry “special items”. You will need a camera for the scavenger hunt. Costumes are encouraged and can earn a prize. Adventurers should arrive at the finish by 5 PM so that their points can be tallied. If you want to participate as part of a group, you have two options. One is that each person can register individually, so that each gets a poker hand, each performs all the challenges, each has a camera for scavenger hunt items, and so on. Your group would simply choose to stick together to share all the Bike Fun. The other is that you form a team that stays together throughout the Extravaganza, so that your team gets a single poker hand, only one camera for the team is required, etc. The rules for teams will be explained at registration. It’s up to you to decide which option provides the most Bike Fun for you. This is all a different sort of Bike Fun than what one typically shares on a Poky Pedal, but Poky Pedalers are encouraged to be part of the Extravaganza. I’ll be volunteering in some capacity, and I’m really looking forward to sharing in all the Bike Fun in that manner. For more information, you can see the PABS Facebook page for the Bicycle Adventure Extravaganza. If you have any questions, you can give John from PABS a call at 715-498-4122.